The number one goal when listing your home is to make your home memorable. Home buying is an emotional purchase, with buyers deciding in the first 30 seconds of seeing the home if this is the one. Your home should look great from the street (great curb appeal) and the front entrance should be warm and welcoming. You want buyers to enter your home and immediately want to see the rest! The list of To Do's to sell your home may be daunting, but taking these steps before you list will make things easier on you in the long run. Here are the top 10 Must Do's to prepare your home for listing! This is something most sellers overlook but the buyer will not. Buyers will look at the kitchen and bathrooms with a critical eye. So, if the grout around the sink or the shower needs to be re-caulked, do it! Clean the carpets and rugs (this might eliminate any weird odors, too). If buyers see evidence that they will have to clean and fix things, they will offer less money for the home. A clean home looks like it has been taken care of and loved. If you need help, enlist a friend or hire a professional cleaning service. Nothing is worse than entering a home with clutter. And, since you are already planning to move, START PACKING! Get all personal items that you do not need or use packed and stored, such as photographs and children's art. You want the potential buyer to see themselves in the home and they can't do that if all they see is you and your family. Remove magnets and notes from the fridge. Storage is something every buyer is looking for and can never have enough of. Take half the stuff out of your closets then neatly organize what’s left in there. Buyers will snoop, so be sure to keep all your closets and cabinets clean and tidy. Empty every closet as much as you can. Remove out of season clothes. Pack all items that you are not going to use in the next 3 months. The kitchen cabinets should not be overlooked, nor should the bookcases, hutches, built-ins, entertainment centers or any other storage space. You want it to look as though there is room for the buyers' things. The exterior of your home is the first thing that potential homebuyers see, so it is important to make sure that your curb appeal is in tip-top shape. If you have any spots that need touched up, now is a great time to do that. Applying a fresh coat of neutral paint to interior rooms where there is a bold color palette is always a good decision. While this may seem like a lot of work, it could make all the difference to a potential buyer, as they may not have the same tastes as you. We sometimes overlook the dirt, lint and dust that can accumulate in window screens and air vents. Vents can be cleared of dust by using a vacuum, and screens can be removed and sprayed with a hose to remove dirt. Cleaning windows both inside and out can have a big impact, and buyers will want to see the view outside from every room. Repair or replace broken or outdated hardware throughout your home. You can install new door handles, faucets, towel bars and curtain rods – fixtures that are readily visible to homebuyers – rather inexpensively. New hardware in the bathroom, kitchen and on windows and doors also improves the functionality and safety of these components. Be certain to replace any bulbs that are burnt out in chandeliers and double check all bulbs on the exterior as well. Open the curtains and let the sunshine in! You may like your privacy, but the buyer doesn't want to think about that when looking at a home. They want to know that light will come in and the house won't be dark. Replace light bulbs and turn on all the lights before a showing or open house. Few things can make a living space look smaller than dim lighting, so spruce up with new bulbs. Wood expands and contracts, which can cause cracks in painted doors and moldings. Filling the cracks with caulking material and repainting will make them disappear and rejuvenate the detailing of your home. Sidewalks, home siding, and porches that are covered in mold, dirt and mildew can be a serious eye sore for potential buyers. Take a trip to your local hardware store and rent a pressure washer to boost curb appeal. Don't leave children's toys and pet belongings out in the open during showings and open houses. Move litter boxes, pet dishes, toys, animal crates and kids' entertainment to less conspicuous areas of the home, such as an outdoor storage unit or garage before each showing or open house. Also think about where you can store things like dirty laundry and dirty kitchen sponges. Most people only use their dining room on special occasions. Make it look as though you are having a dinner party in an hour. Make sure you have a center piece and fresh flowers are an inexpensive way to make someone want to sit down and join the party. If your home is casual, set a casual table. If your dining room is formal, pull out all the stops and set it with China. 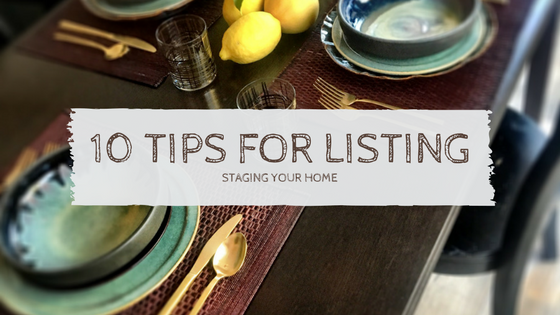 Check out more great sources for listing prep ideas!